Screenshots from HP 3585A Spectrum Analyzer via GPIB? I’m wondering if anyone reading this might have some experience and could chime in. I’m trying to make my HP 3585A spectrum analyzer talk to my Windows XP laptop over GPIB (488.1) with a National Instruments PCMCIA-GPIB card. I’ve been trying both the Keysight IntuiLink Screen Capture software (specifically for this instrument) as well as the KE5FX GPIB Toolkit‘s plotter emulator. The drivers for the GPIB card are installed correctly. 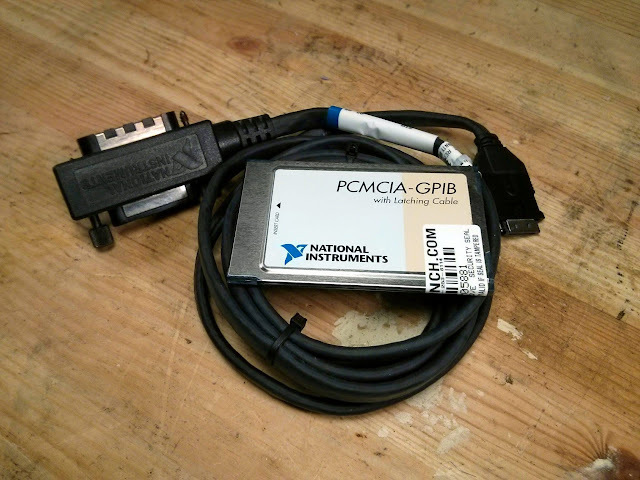 NI’s self-test suite passes; IntuiLink scans the GPIB bus and recognizes the 3585A on address 11, and KE5FX’s toolkit recognizes the GPIB card and is configured for F8 = the 3585A on address 11. Sadly, Keysight’s app seems to do “something” when I ask it to pull a plot from the spectrum analyzer. It pops up a progress bar that takes a few seconds to finish and spawns a new window, but the generated image is totally blank. KE5FX’s app throws an unrecognizable error that’s something about the internal state of the app and exits instantly. Anyone have any experience getting these things to talk to each other? Let me know, I’d love some pointers! Update: It looks like I have a hardware issue with my GPIB interface, a new one appears to have solved the problem! 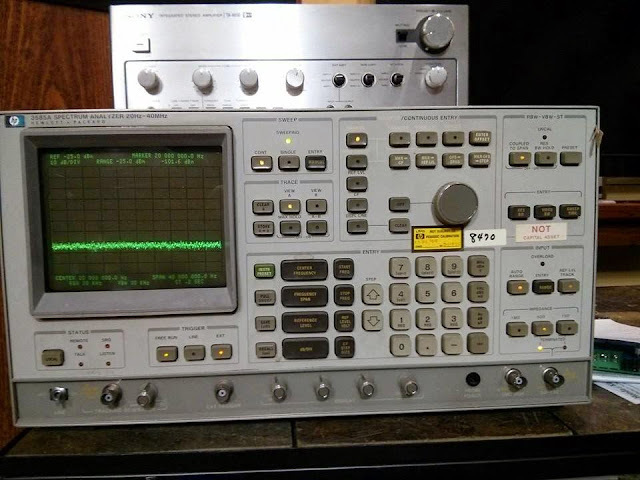 This entry was posted in Computers, DIY, Electronics, Test Equipment and tagged computer, gpib, hp 3585a, ke5fx, keysight intuilink, spectrum analyzer. Bookmark the permalink. 4 Responses to Screenshots from HP 3585A Spectrum Analyzer via GPIB? Hi! : according to https://forums.ni.com/t5/Instrument-Control-GPIB-Serial/How-to-control-HP-3585A-through-GPIB-in-labview/td-p/65045 it may be a 488.1 device, so some automatic GPIB programs can be not compatible. Reading http://bec.physics.monash.edu.au/wiki/Main/HP3585ASpectrumAnalyzer and the manual from http://cp.literature.agilent.com/litweb/pdf/03585-90003.pdf , you should study DUMP and TRACE OUT commands. I have used some old “green phosphor” Hewlett Packard equipments, so if you have some questions, contact me at my email. Thanks very much for the pointers – after quite a bit of diagnostics, I might have some sort of a low-level hardware fault. I’m continuing to troubleshoot and have made a little progress so far. Without a copy of LabVIEW I’m a bit handicapped in my troubleshooting, but I’ve found some Python libraries that make it fairly easy to speak to a GPIB device and so might try that route if I can’t get any of the off the shelf software to cooperate. We’ll see how it goes! Unfortunately his ftp (ftp://ftp.febo.com/pub/n8ur_programs) does not allow anonymous access anymore, but I guess you could reach him to ask if he still has the software. Another possible solution would be to use GPIBWrap.py (http://hccc.org.uk/gpib.html) from Nick Glazzard, which runs fine under Ubuntu and generates png with Mathplotlib. Thanks, those are resources I wasn’t aware of! Seems like a good starting point for some other investigations.